Which of the two photos above do you like better? 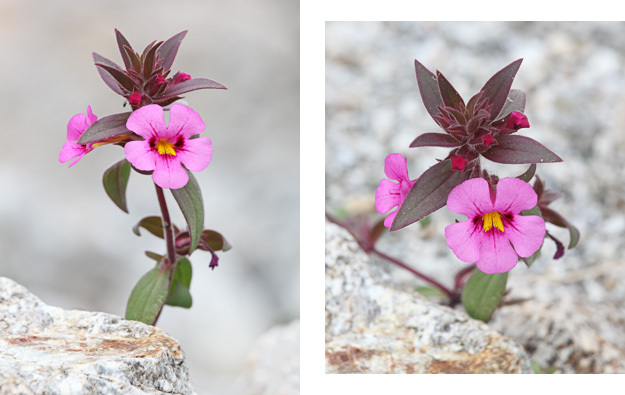 They were both taken of the same flower, with the same camera settings. The only difference between the two shots is the position of the camera. I’ll take a wild guess that you like the first one more. And, I think this photo is better because it has more of an intimate and friendly feeling to it. Now, part of the reason the first photo has this intimate feeling is because the flower is more isolated from its background. But, what’s more important here is the perspective: the first photo was taken from a position looking directly at the flower (which stood just a few inches high). I was lying down on the ground with the camera on the same level as the flower, almost as if I was seeing eye-to-eye with the flower (if the flower had eyes, hehe). The second photo was taken from a more elevated position: I was kneeling and looking down on the flower with my camera. When we look down on things, we tend to have a slight feeling of superiority or conquer, and this diminishes that friendly feeling. I’ve talked about this topic before, as it applies to photographing wildlife, but I think it’s just as important for any kind of nature portrait. The position of your camera in relation to your subject (whether it’s above, below, or on the same level), will determine the feeling you portray in your photo. So, to create that intimate and friendly feeling in your nature portraits, you have to photograph your subject on their level. You have to see them eye-to-eye. Actually, I liked the one on the right better! I think there’s a few things that draw me to that photo: One is that the pattern of the leaves is more interesting. Another is that the plant takes up more of the space. And another is actually the background: It is less washed out, but still blurred, so its fuzzy structure presents a nice contrast to the plant. (I guess I don’t see the flower only as the subject, but more the whole plant). And the foreground is also out of focus on the right, less so than on the left, so the plant stands out more. Very helpful!!! Thank you for posting so many interesting thinks! I liked the first one but didn’t realize why!!! I also prefer the second one. I like that I can see the center detail more and also the angle shows the leaf growth part beautifully. I like the first one but usually shoot them like the second one. It’s interesting that the camera settings are the same – I would have bet the first one was shot using a different aperture than the second one. Your point about getting down low is a very good one. One question though, what, if anything, do you use to protect your clothes? I’ve been toying with the idea of bringing along an opaque shower curtain so I could (1) use it to diffuse the light, if needed and (2) put it on the ground to lay on. Not that I mind getting down on the ground and getting a little dirty but I’m not so sure my wife would go for that :). I like the first one. I think it shows off the stature and shape of the plant better. Hi Steve, if you had shot a single flower, the first one might have been my first choice, but the overhead shot of the second one reveals a symmetry and balance that is more appealing to me. Also the bokeh in the second one includes more detail that gives the flower a sense of connection. Thanks for the explicit presentation in driving your point Steve. While I like the 2nd one, because of the capture of the the buds and young leaves in addition to the flowers, I find the bokeh disturbing the subject, hence I prefer the first one.